The complex antihero embodies both good and evil, and now he's on a quest for vengeance. Click here to play! Aid Wolverine as he attempts to right the wrongs of his past and be in the running for a barrage of special Marvel jackpots. 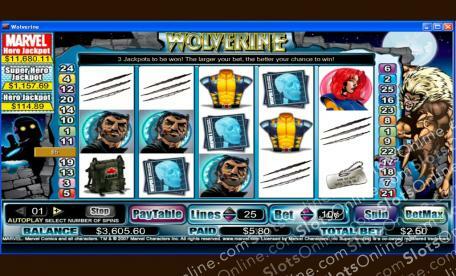 Wolverine is a riveting 5-reel slot played across 25 lines of monetary mayhem, with the more lines opened up multiplying your payout odds on winning combinations. Wolverine is the substitute and can become any other symbol except Scatters. Additionally, if you manage to spin up two or more Wolverines in one go you will be rewarded with up to 3000 times your initial wager. Sabretooth is Scattered and will trigger the Wolverine vs. Sabretooth feature when three or more appear in a single spin. Once inside, you must take control of Wolverine and battle to defeat the evil Sabretooth! Help Wolverine overcome the growing evil by playing and winning at the Wolverine slot today! Sabretooth is Scattered and can pay out up to 100 times the initial wager, as well as activating the special Wolverine vs. Sabretooth feature. Wolverine is Wild and will earn you 3000:1 odds when five appear at once. Additionally, Wolverine can substitute for any other symbol except Sabretooth. When three or more Sabretooth icons are spun up, you will be sent to the Bonus Room where you must take control of Wolverine and do battle with Sabretooth.